Sony previously unveiled a 3D headset at the 2011 Consumer Electronic Show. Now, in a recent interview, Sony’s Mick Hocking is saying that the company may be experimenting with games that use the headset for virtual reality type experiences. At CES the headset was part of Sony’s 3D themed press conference. Sony showed off many new glassless 3D TVs, as well as a portable 3D blu-ray player but the headset was one of the more innovative products. 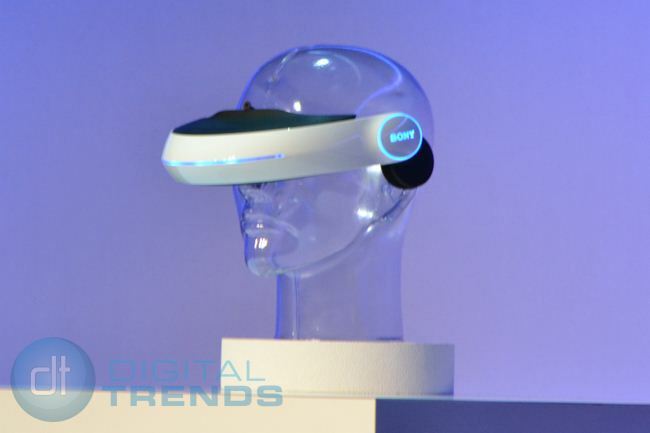 The prototype headset’s visor had twin OLED displays, sported HD 3D video and 5.1 surround sound via headphones which would create a very immersive experience for gamers. Apparently, Sony has plans to immerse gamers into the experience far deeper than passive viewing. In an interview with Develop, Sony London studio manager Mick Hocking discussed the PS Vita, PS3 3D gaming, whether 3D technology was a commercially viable format and then dropped a little more information about their headset project. “The head-mounted display has twin-OLED screens; very high quality,” he said. “At the moment it’s just a head-mounted display; the head isn’t being tracked – but that’s something we’re doing R&D on… We’re working with a couple of games at Sony that are experimenting with virtual reality type experiences. The idea of Virtual Reality has been around for a while (Lawnmower Man, Virtual Boy) but Dvice points out that the primitive A.I. and tracking, which Hocking mentions in the interview, is one of the main reasons why actual VR failed in the early 1990s. With the new technology available, Sony may be able to find virtual reality’s holy grail and make the concept a viable reality. The technology may be the future of 3D gaming, but Sony will probably hold off on producing the headset until well after the next Playstation few Playstation consoles are developed.